Black Milk's official debut Popular Demand dropped last year to critical acclaim across the board. The detroit MC and producer was hailed as the rightful air to J Dilla's crown. 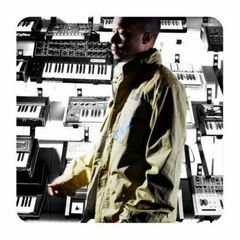 And through his next release The Set Up with fellow Detroit MC Fat Ray and this, his second solo album, he is more than living up to the praise that seems to follow him everywhere he goes. Tronic is not only the best collection of songs from Curtis Cross, but sneaks in as one of the hip hop records of the year. The title may suggest that this record sees Cross embracing technology but it's a wonderful mix of earthy beats and futuristic production. You can tell all this from the first song. Long Story Short introduces itself with a gently tinkling piano then launches into the deepest old school break since KRS dropped Step Into A World. It's pounding beat is enshrouded in raw production and synth washes making the whole thing kind of awkward but loose. This is dramatically contrasted with the following track Bounce. Sounding like the backing tune from an 80's Michael Mann car chase Bounce simmers with a rolling synth melody and a gentle click-clap beat. It's as smooth as Long Story is raw so with only 2 tracks under you belt you're already wondering what the USP is on this record. But that's it's beauty, whereas a lot of hip hop records show their cards too early Cross' main objective is quality whichever form that may take. The tinny funk break on Give The Drummer Sum continues this nod to the old school as a fabulous retro fanfare melody envelopes the whole thing. This is echoed on the soulful Try, full of intricately spliced samples around which Cross slots his effortless verse. Again, in contrast comes Hold It Down with it's deep booming synthesisers and The Matrix, a dark, brooding and deathlessly serious cut curtsy of DJ Premier and featuring some great guest appearances from Pharoahe Monch and Sean Price. It also features the awesome line "You couldn't hang if you were Ving Rhames in Rosewood." Then you've got Cross' rarely seen ability to drop a slice of hip hop so perfect it could storm any pop charts given half a chance. Losing Out is that tune and it's pure class, infinitely listenable, the dopest baseline and some lightning rapping from Cross himself and the mighty Royce Da 5'9. Each verse is spat with strength and power and the production is tight, yet free to evolve as the song progresses. In short Tronic is solid, exciting, supremely impressive and takes this Detroit artist into new territory. His quality was always evident on his previous releases but Tronic showcases every facet of that quality and introduces some more. It's a powerhouse of a record.